First, we got together different pieces of hardware, lids, scrubbers, and pipe cleaners. Then we got our recycled tin cans together and some strong disk magnets. Also, you'll need a hot-glue gun to attach magnets to the hardware and lids. Cassie had a lot of FUN just playing with the magnets and the metal hardware even before we put anything together! She made some Magnetic and Hardware Sculptures! Magnets inspire imaginations! Here is C adding some hot glue to some plastic lids so she can attach the magnets. Here she is pleased with adding the magnets! 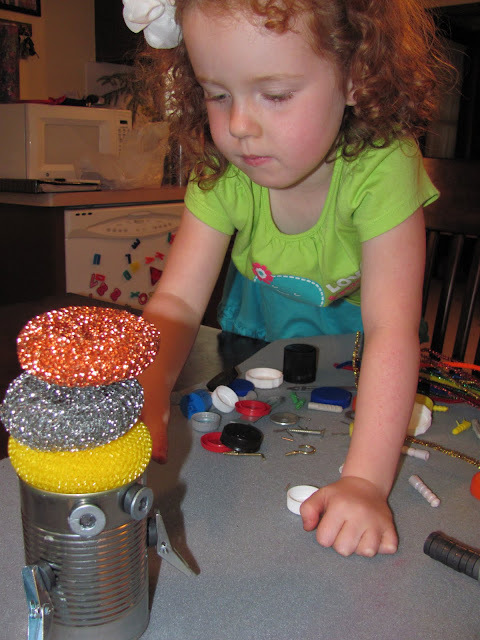 After some of the magnets were glued to the hardware/lids, Cassie began to construct some robots. The nice thing is that the robots can be changed over and over! C liked using the scrubbers for hair. These were just placed on top of the cans without magnets. More play going on here! We added metallic pipe cleaners into the scrubbers for hair and then we were basically done. You could easily add more pieces or cans! Now there is a new toy to play with in our house! 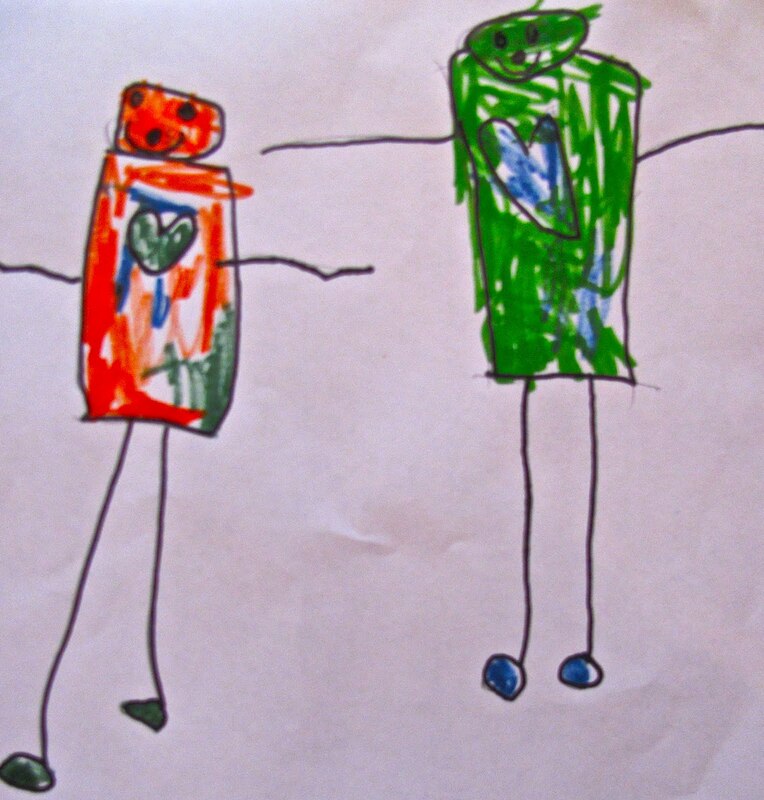 These tin can robots inspired some robot drawings too! Love these drawings! We hope to have many more hours of play with these Tin Can Robots!!! What kinds of toys have you created with kids? Those are absolutely amazing! Thanks for sharing! These are great! Love that the little one drew her robots afterwards too. These kids have 100 languages. really cute! i love her robot drawing as well. What a great way for young children to learn about textures. This is one of the cutest robot ideas I have ever seen!! We have been working on making our own set! thank you for this amazing idea! I am so excited! Oh, I just love this idea! I can't wait to make a set of our own! Thanks for all the inspiration! Really great idea, thank you for showing us it as I never would have found it. This is amazing. AMAZING. Seriously. I think my son will get nothing but magnets for Christmas and this is on the list! Haha. Thanks for sharing! I've pinned and will stumble and share. Love this!! Your child is so creative. It's wonderful that your child can make these. Great job. These really improve the child's creativity and imagination. Great job on the tins. Love these too!! SO clever and fun! My three year old daughter will flip over this!! Mud Painting for International Mud Day!! !